As investigation hits home diocese, can Cardinal DiNardo continue to lead on the abuse crisis? Investigators for the district attorney of Montgomery County in Texas executed a search warrant seeking records pertaining to the handling of instances of alleged clerical abuse at the offices of the Archdiocese of Galveston-Houston on Nov. 28. The spectacle of dozens of Texas Rangers and other local law enforcement swarming the Houston chancery offered the latest unprecedented moment as the church in the United States grapples with the ongoing crisis of the clerical abuse of children and vulnerable adults. The archdiocese is headed by Cardinal Daniel DiNardo, the president of the U.S. Conference of Catholic Bishops and the person leading the U.S. bishops’ response to the crisis. In a statement released on Nov. 28 representatives for the archdiocese said it had no comment on the investigation at this time. The D.A.’s investigation raises questions about how Cardinal DiNardo and his staff dealt with complaints against Father Manuel La Rosa-Lopez, accused by two people of assault two decades ago when they were teenagers. Both victims told The Associated Press that they met with Cardinal DiNardo but felt he did not take their complaints about Father La Rosa-Lopez seriously. The leader of the Houston chapter of the Survivors Network of those Abused by Priests has already called for Cardinal DiNardo to step down to accept responsibility for alleged failures in Galveston-Houston and during a previous position as bishop of the Diocese of Sioux City. Presuming the bad press in Texas will continue, can Cardinal DiNardo continue to credibly lead the U.S. bishops as the conference seeks a way out of the abuse crisis? “The answer is we don’t know,” said Tom Reese, S.J., a columnist for Religion News Service, a former editor in chief at America and a long-time observer of the U.S. church. “We have to wait until the prosecutor comes forward and says what he found and says what the situation is there. 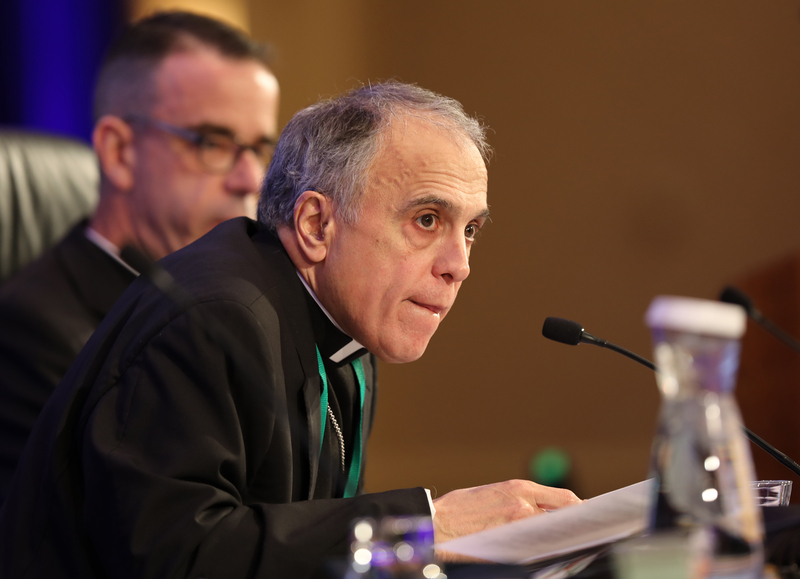 Presuming the bad press in Texas will continue, can Cardinal DiNardo continue to credibly lead the U.S. bishops as the conference seeks a way out of the abuse crisis? Cardinal DiNardo’s office did not respond to requests for comment. Disheartening revelations of cover-up and nearly incomprehensible indifference contained in a Pennsylvania grand jury report released in August have provoked a new round of institutional soul-searching over episcopal accountability and a new willingness among state actors to intervene in U.S. Catholic Church affairs. The reaction to the Pennsylvania report, sparking widespread disgust and outrage anew among U.S. Catholics, seems to have altered the political calculus among prosecutors who in the past did not always aggressively pursue child abuse allegations even when they were reported to them, allowing church officials, catastrophically, to police their own priests. Now prosecutors around the nation have been “jumping on the bandwagon and looking at the dioceses,” Father Reese said. Little noticed, he argues, is that while the grand jury report included plenty of bad news—300 priests accused of abusing thousands of victims over decades—it also included some good news for the nation’s discouraged Catholic community. Every one of the accused priests were either deceased or had been removed from ministry, Father Reese pointed out. “And only two had been accused of abusing a child in the last 20 years. Father Reese finds it hard to imagine that there are many bishops 16 years after Dallas, where U.S. Catholic bishops met to hammer out a response to the then burgeoning abuse crisis, who are not following the essential norms on child protection and reporting promulgated there—especially as headlines and episcopal removals dog charter laggards. Father Reese argues that there is only one way U.S. bishops can restore their personal credibility and the church’s reputation. “Total disclosure,” he said. “List every accused priest, the when and where; what did they know; what was the allegation; how did they respond.” And make sure that the public understands that their diocesan lists of credibly accused priests represents “draft 1.0,” that they will be updated as new accusations and reports are forthcoming, that, indeed they request additional victims to come forward so their no-longer secret archives will be as complete as possible. And what is true for the dioceses is also true for the nation’s religious orders, Father Reese hastens to add. “Frankly, it’s taken the Jesuits this long to figure that out, too,” he said. In recent weeks Jesuit provinces around the country have begun releasing previously undisclosed documentation on priest abusers, a process that is expected to continue. “As you know, in late October we invited C.M.S.M. members to once again consider releasing the names of men with established allegations,” they wrote. “In conversation with bishops this week, we understand a recommendation will be made for dioceses to release names. To date, more than 80 dioceses have done so. There will also be strong pressure on religious institutes to do the same. “For unity in the church and for the sake of victim-survivors, we encourage you to communicate directly with bishops in areas where your men serve and to collaborate and cooperate with the bishops on this important issue,” they said. Father Pavlik explained on Nov. 30 that leaders of men’s religious communities face different challenges in dealing with offenders and credibly accused among their vowed communities than diocesan leaders. In the past, those challenges have discouraged full transparency about past allegations of abuse, he said. But now he believes, “the pendulum has swung” and that leaders of religious orders should reevaluate their positions in light of the increasing pressure to disclose and the growing consensus on the therapeutic value of such disclosures. Good article. “Full Disclosure” is the answer. This victim-survivor (as we’re called here) is still shocked that no one, NO ONE, is addressing abuse by nuns. There cannot be “Full Disclosure” if you never, never talk about the tens of thousands, maybe more, of men and women who were abused by nuns during the last 50 - 60 years. If this fact is not revealed before, during, or immediately after the February Synod, and another Big Secret comes out concerning abuse by Diocesan nuns and women Religious after the Synod, it’s all over but the shouting. "Abuse by Diocesan nuns and women Religious". Good point. I'm not aware of any Diocesan nuns; the only ones I ever knew were members of religious orders. I attended a Catholic school from 1956 to 1964 (so more than 60 years ago, at the start). The nuns were faced with classrooms of 60+ children, the result of the Baby Boom and large suburban parishes. I witnessed plenty of corporal punishment, verbal and emotional abuse and shaming (much of it directed to children who, in later years, would have received special education services), and exhortations to mindless obedience to them, the parish priests, and the Church in general. If there was sexual abuse, I didn't experience it or witness it. But whenever I grieve and revisit my anger about those classrooms, I also admit that women with modest education and faced with overwhelming challenges in these classrooms could and did break under the pressure. My eighth-grade teacher was removed midyear because she had a psychological breakdown. I don't deny that women can be guilty of sexual abuse; I just believe that in addition to personal responsibility, there were systemic pressures at work to cause the harm children experienced at their hands. Jeanne, some women’s congregations are under the jurisdiction of the local ordinary, and others are pontifical. You make some good points above. I would add that they often worked for less than minimum wage and had little or no financial support from the bishop, while the priests had much more comfortable lives. Thanks for the information about the two jurisdictions for congregations. Yes, the nuns worked for paltry pay, and at least two consequences are visible today: the escalating tuition at parochial schools because so few nuns teach and lay teachers must be paid (even if not commensurate with public school teachers), and the tremendous cost of caring for elderly sisters whose congregations don't have the financial means to do so. Bishops were glad to have the nearly-free labor of nuns, but don't seem to feel financial responsibility to them now. The disparity between life in the convent and life in the rectory was displayed vividly in the movie "Doubt" a few years ago. I agree with "Full Disclosure" but believe that sexual abuse suffered by Nuns/Religious from Priests must be part of this process. I have read a number of accounts by Nuns/ Religious of horrific accounts that are just so bad that it still shocks to this day. I was taught that Priests were not God but a Disciple of Christ just as Saint Peter. Priests are the next closest to Christ. So why is it that Diocesan Priests do not take a "Vow of Poverty" as the Religious Orders of Priests? Accumulating Wealth is not like Christ. Diocesan Priests need to take a "Vow of Poverty" just as other Religious Orders such as the Jesuits. I have lost total respect for such hippocracy. My experiences involve a Religious Teaching Order of nuns that educated the wealthy Catholic elite. I attended their school in Bloomfield Hills, Michigan for 12 years, from 1958 to 1970. I was molested at the beginning of my Senior Year. It altered the course of my life forever. Somehow our church leaders are struggling to understand what's transparently obvious to most of the laity. Our leaders are badly compromised. Regardless of whether they directly abused or covered up, they were in command when this rampant evil cancerous culture spread unchecked in Christ's church. There is no opportunity for plausible deniability. They had to know, and yet here we are. Our church needs new faces and new voices, with a new culture of servant leadership involving all stakeholders, and a rededication to the mission of Christ on earth. That's my Advent prayer for our church. What Cdn DiNardo thinks or does now is immaterial. The pope usurped the USCCB authority, and DiNardo’s authority, by stopping the vote in Baltimore. Both were neutered and humiliated. And that was easy because the US bishops have little backbone. Now, it is Cupich who is in charge of the Church in America. Cupich is the pope’s man. A puppet of the capo di tutti capi. Surprised that a veteran like Tom Reese is still trotting out the old chestnut that the Pennsylvania report shows that most abusers had either died or been removed from office, as if the problem has been taken care of--he ought to check in with Prof. Marci Hamilton at Child USA at U. Penn. to hear about the most recent and frequent cases of abuse by church employees. It is such an institutional trick to cite statistics to put a good spin on bad news. Reese should know better than anyone else how many decades it takes a victim to achieve healing whether his or her abuser has died or not. What the bishops have been doing for so long is characteristic of large multi-national corporations which put institution first before accountability. Local civil authorities are laggards also in bringing these criminals in fancy hats to justice. Systemic failure all around in protecting the most vulnerable members of our society. This article also appeared in print, under the headline "As investigation hits home diocese, Cardinal DiNardo faces questions," in the December 24, 2018 issue.